Mac OS has always got limited number of applications for everything, and Windows has an abundance which makes it more confusing on which one to use. Still, in Mac OS X every app has something to say for itself. And when it comes to bittorrent client, there are a few good names like Limewire, µTorrent, Transmission, Tomato Torrent etc. but from all of them µTorrent was the best I used and found for downloading torrents. µTorrent is the world’s most popular BitTorrent client. Most of the features present in other BitTorrent clients are present in µTorrent, including bandwidth prioritization, scheduling, RSS auto-downloading and Mainline DHT (compatible with BitComet). Additionally, µTorrent supports the Protocol Encryption joint specification (compatible with Azureus 2.4.0.0 and above, BitComet 0.63 and above) and peer exchange. As I stated already, the light weight feature of its is the best and it uses just around 6 MB of memory while being used, unlike Limewire which I checked while writing this review, was 10 times higher memory eating than µTorrent. The client is also customizable and icons, graphics can be changed by anyone and created by self. Also the preferences has options of controlling the bandwidth speed etc. so that the normal internet usage is not disturbed by the speed of files download through the client, and also options like downloading after opening the torrent file, setting up of the default download location. µTorrent is pretty good. 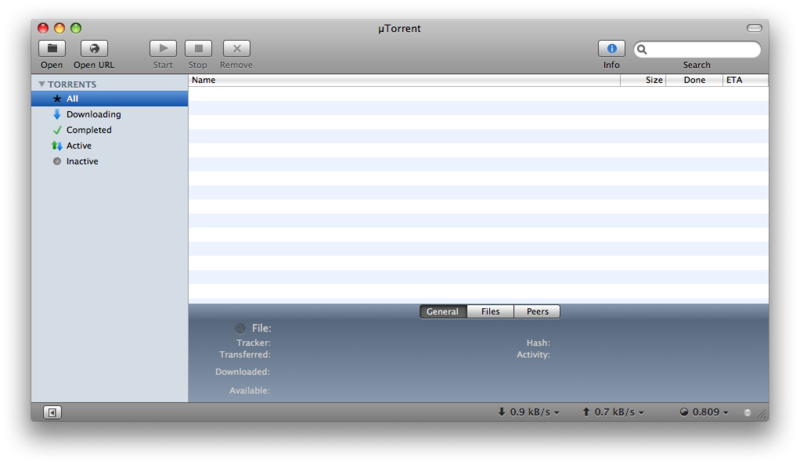 I have also used BitTorrent but µTorrent seems better then it.